The present summary is in contrast to the usual KWD market reports, which usually contains figures, spreadsheets and charts, a description of the pipe markets in and around Russia. It can be read like an exciting book about what happens on the pipe markets but also in respect of political and economic environment. Many numbers in this study (relating to the pipe market) require an explanation, so we decided to embed them in the explanatory text rather than just put them into tables. While working on this summary we have collected many reports about the pipe markets and in addition we spoke with many market participants, assisted by a native speaker who is familiar with the pipe market. The answers and market estimates can be found in the corresponding chapters. Each section ends with the reports from KWD-globalpipe on the same issue over the period of 2013 – 2015. The present overview on the pipe markets in and around Russia describes both the various pipe markets as well as the political and economic conditions. So the markets for heating & plumbing, district heating and infrastructure pipes are explained. A brief introduction to the different markets is followed by the different pipe materials used and the main market players. The known KWD lists of pipe manufacturers by material and company profiles are also available. Seen from a political perspective the chapter “Import Substitution” seems to us very interesting. It describes how the Russian government is trying to reduce imports and to increase the share of products “made in Russia”. Also in the pipe markets, the regulations already have consequences in some areas for example in the football stadiums which are presently under construction. But also in other areas the political administration interferes, such as described in chapter 9.1.5 “Tax Maneuver”. In chapter 8, statistical figures and estimates on building construction and completed housing units are summarized. The final chapter is devoted to the political, economic and financial situation of the countries and their impact on import and export. 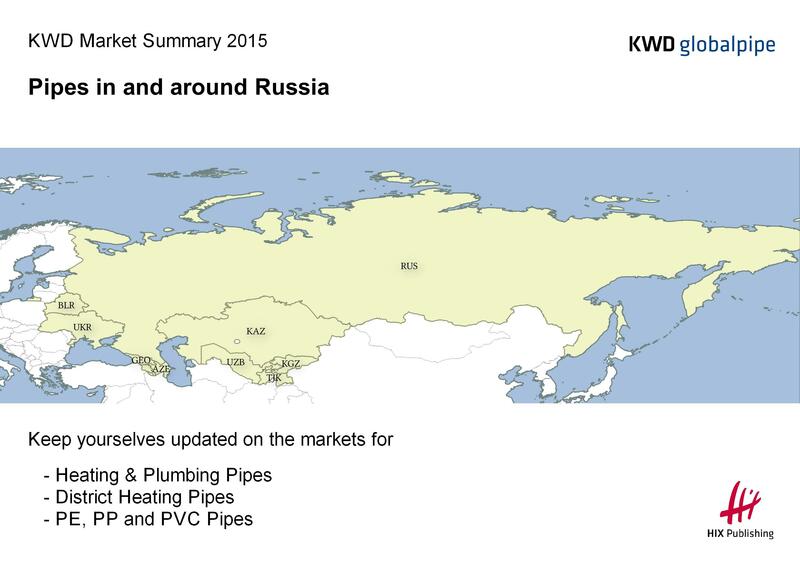 Our KWD Summary “Pipes in and around Russia 2015” contains 156 pages with colored graphics. The printed book including the digital version on CD costs 695,- Euros for our subscribers. Please find more detailed information in the attached brochure.